I don't know if you've noticed, but if it has garlic in it, I'm in. Since the rain has frequented this month, my appetite for savory and comforting meals has increased along with! And this is one simple dish that I like to make because it is so cheap but still wonderfully delicious and healthy. As I've just moved out of my house to live near school, this really helps me a lot in saving money for food. Plus, all the ingredients are familiar and available in the markets all year round. When you feel either lazy or uninspired to come up with an interesting dish but still want to end up with something incredible, herbed and sautéed veggies is what you want to make. Through the times that I've been on a tight budget, I learned that perfuming is quite the simple but effective trick. Just grab whatever fresh produce you have in store, play with several herbs and spices and you have yourself a mouthwatering dinner! I try to mix up and interchange my herbs between parsley, cilantro, sage and rosemary but this time, I chose oregano, thyme and my favorite, basil, to go with my cauli and tomatoes. I usually eat this with brown rice in order to balance out the flavors as well as to smash some carbs in, but you can have it as is if you'd like a lighter meal. Drizzle a generous amount of olive oil on a skillet and then set over medium heat. 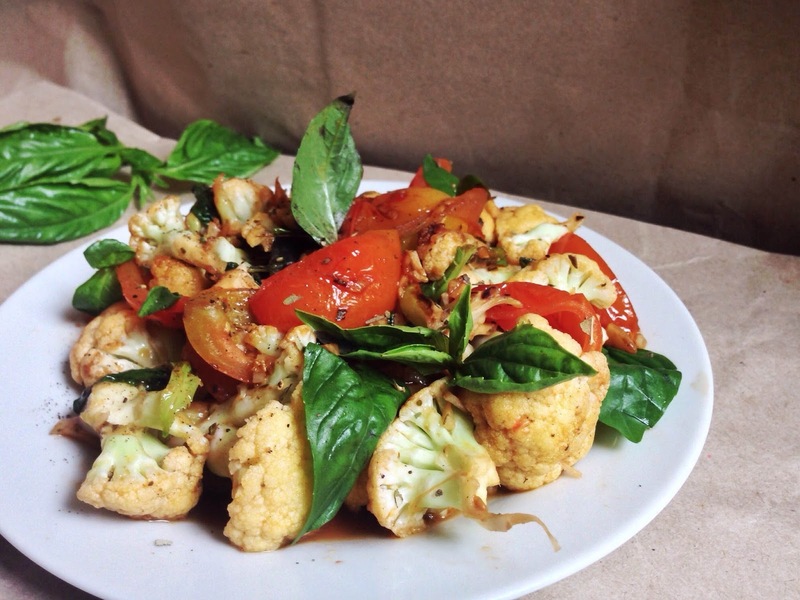 Mince the garlic cloves, quarter the tomatoes and then chop the cauliflower into 1-inch pieces. Once the oil is hot enough, add the garlic and cook. Stir in cauliflower once the garlic begins to brown. When the cauliflower starts to tender slightly, add the tomatoes, a dash of sea salt and pepper and lemon juice (if using). Stir occasionally. Toss in basil, oregano and thyme and then stir one more time before covering. Cover and let simmer for around 4-6 minutes. Stir one last time before serving.